Since graduating with a Cuisine Diploma, Allan Castellote has developed his passion for innovative and creative cuisine in his Michelin plate restaurant Le Senso. Born in France, Allan Castellote studied philosophy and law before following his childhood passion, cuisine. With one grandmother from the Picard region of France and one from Spain, he was exposed to two different gastronomic cultures from a very early age. Enrolling at Le Cordon Bleu Paris and graduating with a Cuisine Diploma was a natural step to becoming a chef. After graduating, Allan joined the Meurice hotel’s three Michelin starred restaurant in Paris, under chef Yannick Alléno. It was here that he met chef Philippe Mille, "Meilleur Ouvrier de France" (Best Craftsman in France). When chef Mille took over the reins of the kitchens at the Domaine des Crayères in Reims, Allan followed him and stayed there for one and half years. During this time, the restaurant was awarded two Michelin stars. Allan returned to Paris as chef de partie at the two Michelin starred Carré des Feuillants, run by an eminent figure in today’s culinary world, chef Alain Dutournier. He also worked with the teams at the Trou Gascon, another restaurant run by the Michelin starred Chef. Allan then joined chef Christophe Moisand’s brigade at the Westminster hotel’s one Michelin starred restaurant, Céladon. Allan Castellote developed and perfected his skills with all these talented Chefs and his chef instructors. 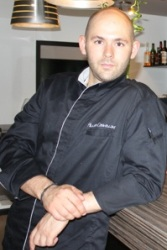 In partnership with his brother, Allan opened Le Senso restaurant in Beauvais in 2013. Their menu revolves around noble products, originality and discovery.